Scott Henry played two seasons with the University of South Florida, but he made an impact. Serving as the club's designated hitter, Henry made the 1989 year-end all-conference team, one of several South Florida players to do so. He went from that season to the pros. His pro career lasted five seasons. He never made AA. Henry's career began that year in 1989, taken by the Athletics in the 49th round of the draft out of South Florida. Henry played his high school ball at Leto High School in Tampa. Henry turned pro after playing the 1988 and 1989 seasons at South Florida. Henry spent his first pro season in the rookie Arizona League. He got into 49 games there in multiple positions and hit .279. He then split 1990 between short-season Southern Oregon and single-A Madison. He hit .245 in 52 games between those two levels. 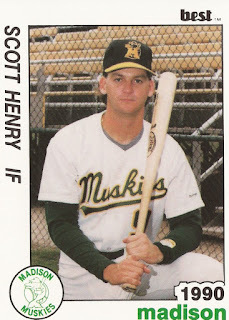 Henry's final year in affiliated ball came in 1991 back at Madison, getting into 105 games and hitting .289. Henry then moved to unaffiliated Reno in the high-A California League. His average improved to .297 over another 105 games. Henry also tried his hand at pitching. He took the mound in eight games for Reno in 1992, after doing so in five games at Madison in 1991 and once in 1990. He posted a 2.79 ERA over 9.2 innings in his time at Reno. His final pro time came in 1993 at independent Duluth-Superior. Over 67 games played as an infielder, Henry hit .303, ending his career.